Clinique have recently been ticking all of my boxes where eyes are concerned and I've been really enjoying using three of their products combined. Their Chubby Lash mascara, Just Browsing Brow Styler and their Pretty Easy Eyeliner Pen have been three of my top three make up pieces since receiving them and I've found myself reaching for them daily, or at least all of the days that I manage to wear make up. I personally didn't think that the Chubby Lash Mascara would be something that I would like, as fattening my lashes isn't my main goal when it comes to mascara and I normally would go for something more lengthening, but I'm completely and utterly obsessed. The brush is in my opinion the perfect size and I find it gets to every lash beautifully, coating them all really well. It's a buildable consistency if you want to create lots of drama, but with results being pretty instantaneous, for the look I like to achieve, it's not necessary to build it up any further, and I wouldn't personally want to risk getting any clumps. I was shocked to see quite how long my stumpy lashes looked on application and so I've found myself to be pleasantly pleased with the results. I'm absolutely all about the brows and so when I saw Clinique's new Just Browsing Brush On Styling Mousse, I knew I just had to give one a whirl. Brows are everything for me when it comes to make up and I find that I've been using this to finish my already filled in brows to create that shape and "undone" look that I love. The tint, whilst really lovely, does just that- it tints and sadly doesn't fill in my brows, which is the look that I personally go for. For a quick make up ready to dash out of the house, I absolutely would use this to add a little something to my brows, but for now, I'm loving using it as more of a "setting and styling" mousse, for thicker and fuller looking brows. For me, the Pretty Easy Liquid Eyeliner Pen is where it's at. This Eyeliner is amazing and I've found myself raving about it so many times now. It's the perfect size, pigmentation and Blackest Black finish and I personally cannot get enough. It's great for getting as close as you can to the lash line to create a fine and delicate line as opposed to anything too thick and over the top, plus it's fine pointed pen shape is the perfect tool for a fine feline flick and applying with such ease makes it a real winner in my opinion. 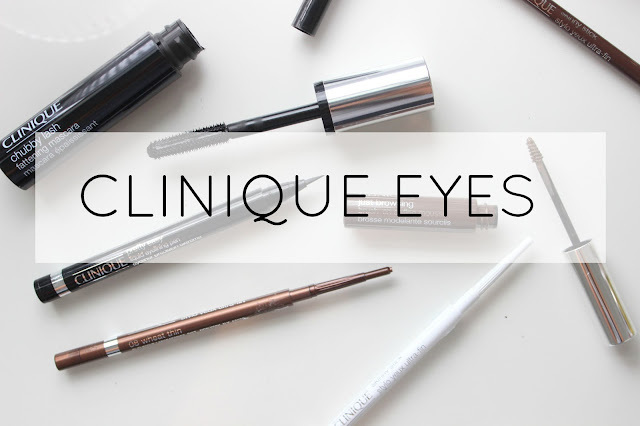 Along with Clinique's new Skinny Sticks (£15.00) which I'm personally not 100% sold on yet, Just Browsing (£16.00) and the Pretty Easy Eyeliner Pen (£19.00) will be available to buy at the end of this month (31st July), whilst the Chubby Lash is already available in four shades costing £17.50. What do you think of the look of these products? Do you think you'll be sold like me? I have never heard anything about the eyeliner pen but it looks and sounds amazing! I will definitely be adding that to my list of things to buy. What lipstick are you wearing here?